Image source: United States Library of Congress. 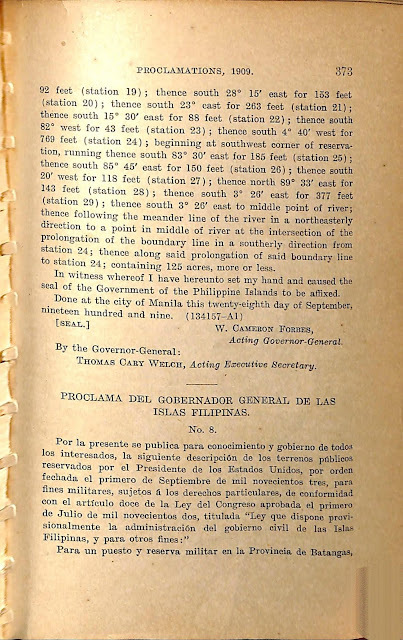 The present-day district or area in Batangas City that people to this day still refer to as Camp McGrath used to be an installation of the United States Army during the American colonial era. 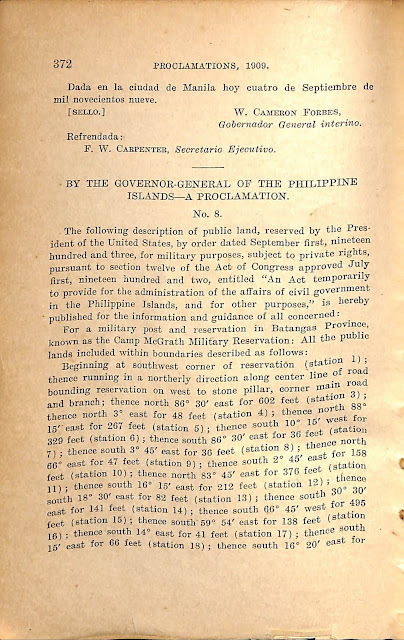 In 1909, citing an order the President of the United States1 to “provide for the administration of the affairs of civil government in the Philippine Islands,” then Governor-General W. Cameron Forbes issued a proclamation for the reservation of land and the creation of the Camp McGrath Military Reservation. The very same proclamation would later be revoked as per the recommendations of the Adjutant-General. 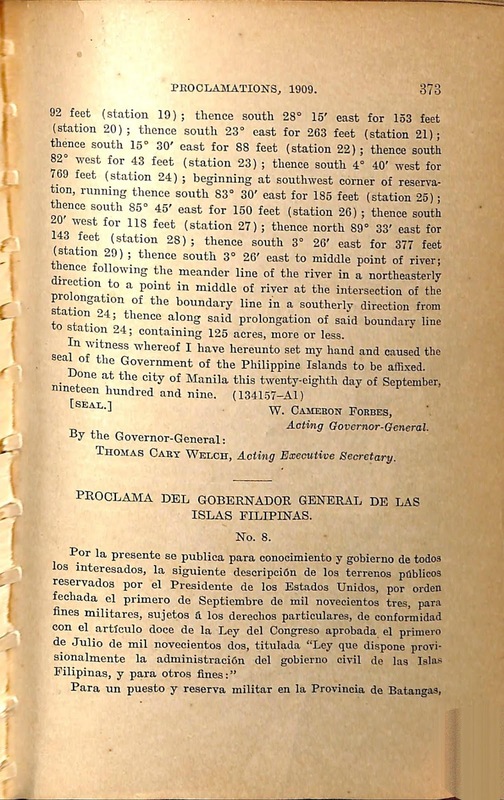 The two proclamations2 are provided below both in text and graphic formats. 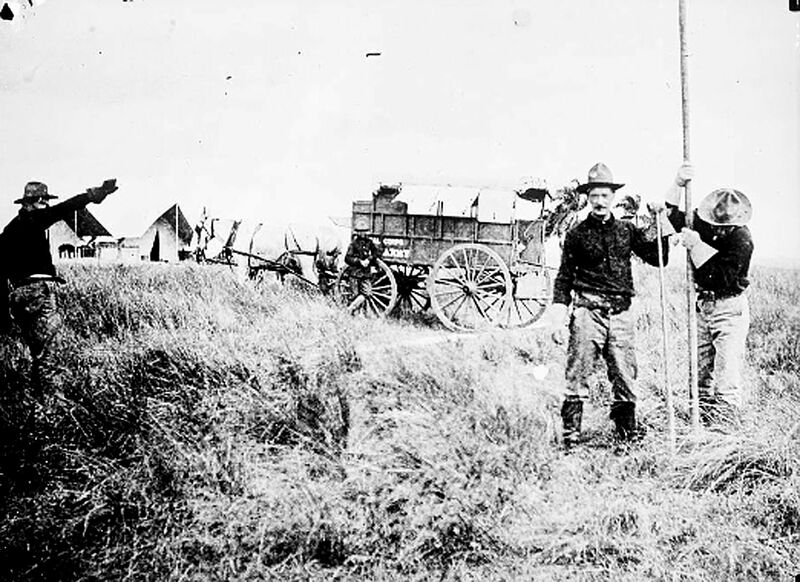 Beginning at southwest corner of reservation (station 1); thence running in a northerly direction along center line of road bounding reservation on west to stone pillar, corner main road and branch; thence north 86º 30’ for 602 feet (station 3); then north 3º east for 48 feet (station 4); thence 88º 15’ for 267 feet (station 5); thence south 10º 15’ west for 329 feet (station 6); thence 86º 30’ east for 30 feet (station 7); thence 3º by 45’ for 36 feet (station 8); thence north 66º east for 47 feet (station 9); thence 2º 45’ east for 158 feet (station 10); thence 83º 45’ east for 376 feet (station 11); thence 16º 15’ east for 212 feet (station 12); thence 18º 30’ east for 82 feet (station 13); thence 30º 30’ for 141 feet (station 14); thence 66º 45’ west for 495 feet (station 15); thence 59º 54’ east for 138 feet (station 16); thence 14º east for 41 feet (station 17); thence south 15º east for 66 feet (station 18); thence south 16º 20’ east for 92 feet (station 19); thence south 28º 15’ for 153 feet (station 20); thence south 23º east for 263 feet (station 21); thence south 15º 30’ east for 88 feet (station 22); thence south 82º west for 43 feet (station 23); thence south 4º 40’ west for 789 feet (station 24); beginning at southwest corner of reservation, running thence south 83º 30’ east for 185 feet (station 25); thence south 85º 45’ east for 150 feet (station 26); thence south 20’ west for 118 feet (station 27); thence north 89º 33’ east for 143 feet (station 28); thence south 3º 26’ east for 377 feet (station 29); thence south 3º 26’ east to middle point of river; thence following the meander line of the river in a northeasterly direction to a point in middle of river at the intersection of the prolongation of the boundary line in a southerly direction from station 24; thence along said prolongation of said boundary line to station 24; containing 125 acres, more or less. 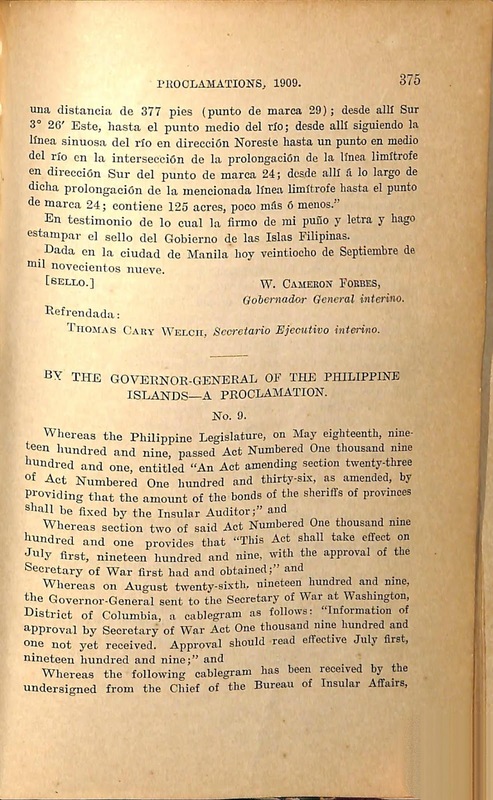 In witness whereof I have hereunto set my hand and caused the seal of the Government of the Philippine Islands to be afﬁxed. THOMAS CARY WELCH, Acting Executive Secretary. 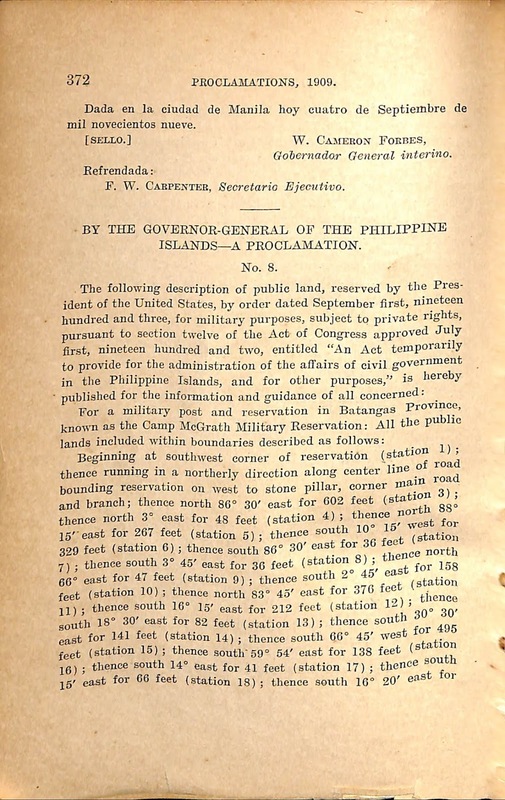 Now, therefore, Proclamation Numbered Eight, current series, issued by the undersigned on the twenty-eighth day of September nineteen hundred and nine, publishing the description of a parcel of public land, reserved by the President of the United States for a military post and reservation in Batangas Province, known as Camp McGrath Military Reservation, is hereby revoked. 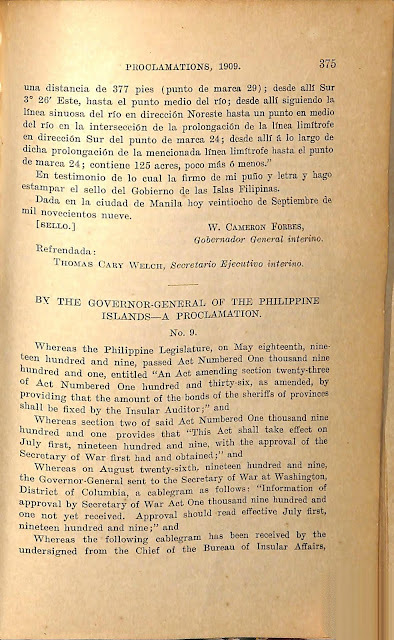 In witness thereof I have hereunto set my hand and caused the seal of the Government of the Philippine Islands to be affixed. F. W. CARPENTER, Executive Secretary. 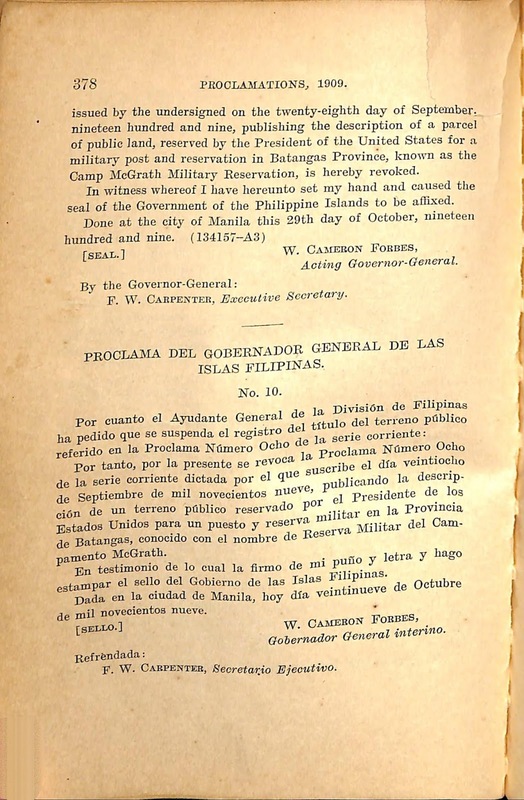 Proclamation 10 series of 1909 in English. Proclamation 8 series of 1909 in English and Spanish. 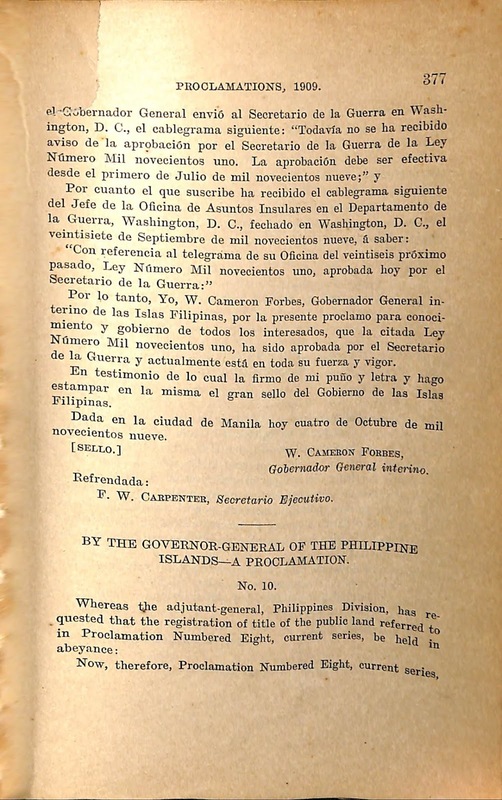 Proclamation 8 series of 1909 in Spanish. Proclamation No. 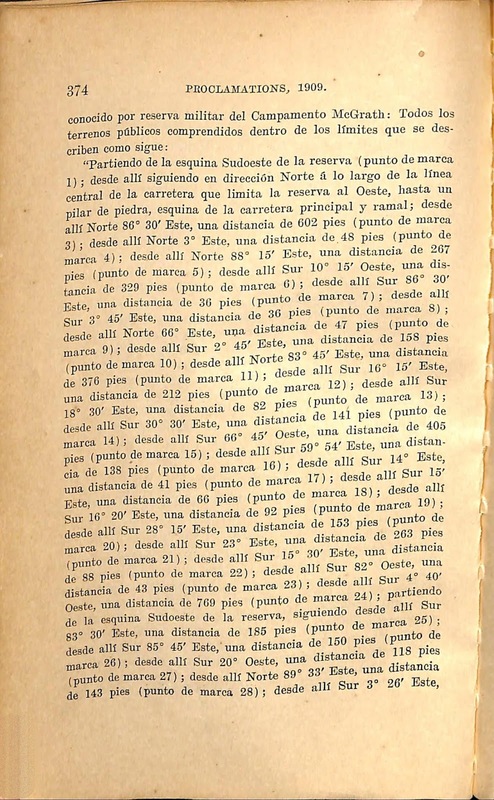 10 series of 1909 in English. Proclamation No. 10 series of 1909 in English and Spanish. 1 “Theodore Roosevelt,” was the United States President in 1903. Wikipedia. 2 “1909 Proclamations,” online at the Internet Archives.